Topping our last Top 10 of 2012 is a video by beloved guitarist/songwriter Stephen Bruton, in a performance with The Resentments. This 2006 recording from Germany captures a classic Bruton moment, song, and collaboration with his longtime friends. Our review of North Wales guitarist Phillip Foxley's One song is all you need... was the second most popular thing on our site, with Austin's favorite new cover/mash-up band (as well as our current Featured Artist) Hey, Gurl coming in third. 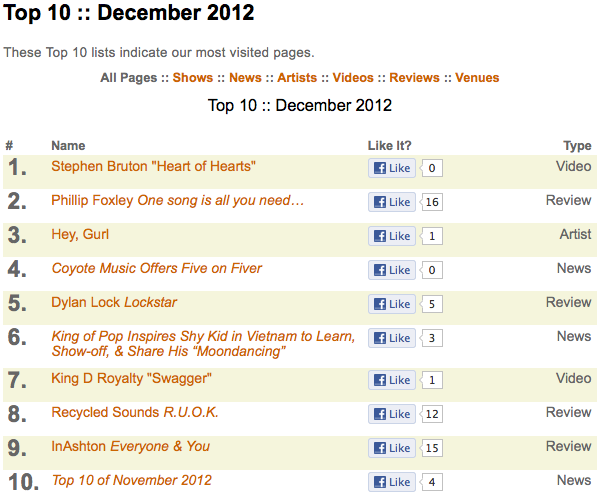 Numbers five through nine of our Top 10 were our review of Dylan Lock's "Lockstar," Tu Michael's incredible dancing in Vietnam, King D Royalty's "Swagger," Recycled Sounds' compelling R.U.O.K., and our review the New York band InAshton's Everyone & You. We are excited to bring such a diverse group of new talent to your attention. Check out their music and support what you enjoy! 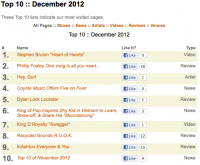 Rounding out our final Top of the year was our next-to-last Top 10, from November 2012. On behalf of our new writers, Lauren and Ringo, Coyote Music wishes you a happy new year, along with our thanks for visiting the site and helping spread the word about the wonderful artists we promote.